Here’s what I’ve noticed in this new era of hyper-turmoil and uncertainty — many organizations are turning off their innovation engines, waiting to see what happens next in a world in which volatility is the new normal. The New Yorker had a great article in 2009 after the financial meltdown, “Hanging tough,” that outlined how some companies choose to ensure that they stay innovative in recessionary times – while others did not. In the context of the uncertainty of today, it’s worth a read. For example, they contrast two cereal companies: one that chose to focus on innovation despite uncertainty, while another did not. My recent discussions with Fortune 1000 CEOs and senior executives in both UK and the US certainly indicate that this is happening again. Post-Brexit, uncertainty and aggressive indecision is roiling the C-suite in the UK — deferring decisions has become the norm. In the US, the never-ending election has placed a pause on most big decisions — inaction has settled in like a wet-sponge! Big question – in this context, is the UK done? Can America innovate again, or is this a cultural and leadership ‘new normal?’ Here’s what I know – the winners and losers of the future are being determined right now! Yet history has taught us, over and over again, that those who are aggressive with innovation, and who align themselves to future trends in times of uncertainty, are those who win in the long run. For years, I’ve talked on stage and in my leadership meetings of the key observation by GE’s Chief Innovation Consultant. Simple, powerful guidance: breakthrough performers manage to accomplish great things because of a decision to focus on innovation right in the middle of an economic challenge or an era of uncertainty– rather than waiting till they came into a recovery phase. So it really comes down to this: when do you innovate? Are you going to wait until you are comfortable that an era of uncertainty is over? Bad decision — because economic and political volatility is the new normal! Everything we have learned has taught us that the winners were those who decided that it was an important thing to keep moving ahead despite massive amounts of uncertainty. Get out of your future-funk! 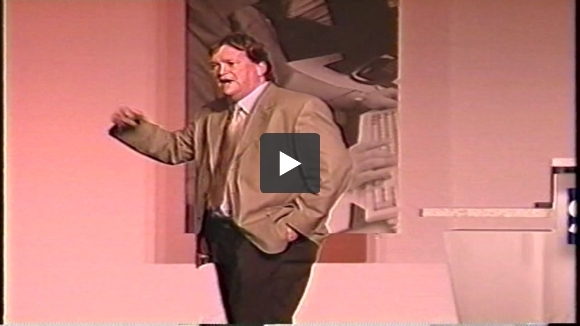 Try this clip from a keynote I undertook on stage after the meltdown of 2008-2009. “Innovators get out in front of the recession“. Read the article. It’s powerful stuff! Given that, what do you do? Change your culture and set out to achieve breakthrough results despite uncertainty! Here is some more innovation-soup for your innovation-soul! Listen to the rebels – and other ideas for innovation! How can you best guide your organization into a faster future? As someone who spends a lot of time talking, writing and speaking about trends and innovation, and who is constantly taking a look at trends, I have a list of what I think works. With the rapid rate of change within every industry, it can be extremely difficult to keep up with what’s important and what’s not, not to mention keeping on top of the trends, challenges and opportunities that should be guiding your activities and strategies. There might be plenty going on within your industry, as the result of rapid new business strategies, rapidly evolving business models, heightened market competition, ever growing volumes of research and knowledge, and countless other challenges. To be effective at what you do, you must keep on top of these trends, and determine how to adjust your activities and strategies accordingly. You should focus on building a strong collaborative culture within your organization, using both leading edge tools and technology as well as ensuring that your culture supports a heightened degree of informal, personal contact. Take the time to engender and build an informal, “open-door” culture that promotes regular and ongoing contact throughout the organization. Encourage feedback, complaints and observations, as well as a culture that provides for sharing of leading edge trends, challenges and opportunities. You can’t listen only to people within your organization to spot the trends that will affect you — you have to go beyond them and listen to what others are saying as well. That’s why figuring out the future is no longer restricted to listening to the “usual suspects” inside; — 21st century leaders recognize that everything in their industry is being affected by events, trends and developments far beyond the norm. And yet, taking the time to listen “outside of the box” can be one of the most important things you can do. That’s why you shouldn’t just “think” outside of the box – but you should on a regular basis “step” outside of it. One way of doing this is by ensuring that you take the time to place yourself in completely different circumstances. Pick 2 or 3 conferences each year – in completely unrelated, different industries or professional that are far beyond the norm! Go and listen – and see what another industry is saying! You might be surprised by how invigorating an experience it can be to open up your mind to what is going on elsewhere. You may find that it will help you discover the trends that will affect you in the future, long before your traditional trends radar might have picked them up. Often, the trends that will affect youan be found in the offbeat chatter by those who are busy redeveloping the future right around them. Those leading edge trendsetters are often at odds with everyone else. They have different views and opinions. They’re the rebels in the crowd, eager to cast off the past to develop a future that will be very, very different. They’re busy tearing apart the conventional business models that have guided you for ages; they have different ideas as to the nature of the product or service that is delivered; they are all too eager to change everything around them to create the future as they see fit. They are often marginalized, simply because their aggressive attitude in changing the future can make them rather unlikable by many. What should you do? Learn to learn from them! Seek out the rebels in your organization- you might not like what they have to say, but often, they are probably right in what they will tell you. Great leaders recognize that while many people have an attitude, outlook, culture and approach to life and business that is completely at odds with their perspective – they are willing to listen to what they say because change often emanates from such people. There’s no doubt that things change very rapidly in our world today. Need evidence? A few years ago, there was no Uber. Today, its’ causing havoc, challenge and opportunity worldwide. The result is that many organizations are now scrambling to deal with a new reality. Part of the process of reinventing your relevance consists of challenging the typical organizational structure. Many people in our economy today don’t work within the traditional corporate model that has worked in the past – they are ‘nomadic workers.’ Many young people continue to reject the traditional career path of long term careers with large organizations. Instead, they establish themselves in small, micro-organizations that provide needed skills to a corporate audience regardless of where they might be. Are you reaching them with your efforts? Not only that, but there is a lot of talent in the newly-disenfranchised’ : – those white collar workers who were laid off in the last 10 years through a variety of recessions – and who have established small, home-based businesses from which they provide their skills to a global audience. They’re working within your community of interest, but are they a part of your strategic plan? Step back and consider where the skills you need might exist today, and ensure that you change your strategies, activities and capabilities so that you reaching out to all of them. When a food manufacturer was trying to find out how to improve the changeover time of one of their assembly lines, they hit upon a novel solution: bring in an Indy race pit crew to show them how. Their thinking was, who has better mastered the talent of “quick- thinking, quick work” than a group of people who can instantly change several tires in a highly coordinated team effort that lasts only a few seconds? It was an offbeat solution, but it certainly did the trick. That’s why you should keep an eye out for the quirky, innovative, unusual things occurring within your industry — look for weird ideas and capitalize upon them! There is no doubt that every organization has suffered from rather aggressive indecision through the last several years, brought on by war, terror, a challenged economy, and much uncertainty. The impact has been dramatic – many people just can’t seem to make decisions about many matters of the day. I certainly see this as a speaker – while I used to be regularly booked as far as a year in advance, now some organizations are booking me just a few weeks before their conference or event. Why? Because uncertainty has led to a degree of decision stagnation. Pummel this trend to the ground before it goes any further. Make sure your organization continues to run by timelines, deadlines and clear goals and objective. Carefully ensure that your culture provides for regular decision making, not deferral and discussion. There are quite a few issues you are probably wrestling with, and maybe some of them have been around for far too long. What should you do? Encouraging risk taking is one method of ending complacency, as is rewarding failure. If your organization can’t make decisions, then a bit of a cultural change is probably necessary! Last but not least, get excited about the future again! There have been so many challenges through the last few years, that many people in the business community have lost their sense of purpose and their passion for the future. The key message for you is – get over it! We’re in for a bright and wonderful future, and it’s by getting excited about the future again that you can best prepare and plan for it.